Yesterday, we published some commentary written by author Steven Metz where he argued that a US-orchestrated military intervention in Iran would be "one of the worst blunders in American history." And while Venezuela has continued to attract most of the media attention and speculation that the US could launch a full-scale proxy civil war in that country as it seeks to oust the Maduro regime (using any tools necessary, including a false flag attack, to justify the incursion), thousands of miles away in the Persian Gulf, tensions between the US and Iran are quietly escalating. As RT reported Sunday, an Iranian submarine successfully carried out its first cruise missile deep-sea launch during a naval drill in the waters south of Iran. The drill was interpreted as a warning to the US following the return of US aircraft carriers to the region after a long absence, but it also took place within the context of wider Iranian naval drills in the Gulf, Strait of Hormuz and Sea of Oman. 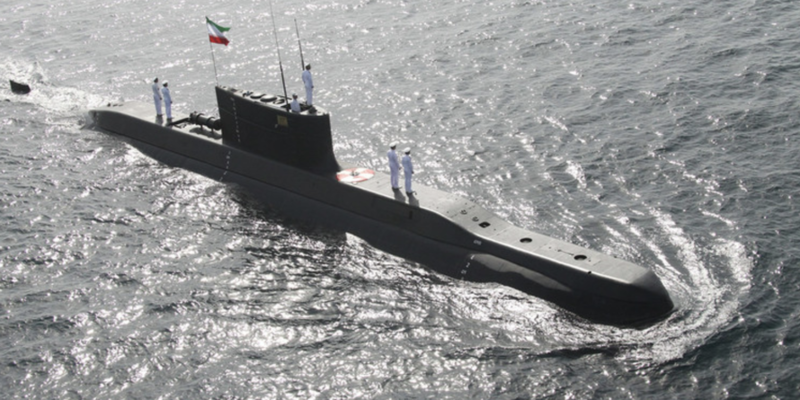 Iranian Navy commander Rear Admiral Hossein Khanzadi told local media on Sunday that a Ghadir-class sub fired an anti-ship cruise missile from underwater for the first time earlier in the day. Clips of the launch were circulated to Iranian television. The launch was part of Iran's "Veleyat-97" naval exercises, a series of war games that are taking place in the area around the Gulf. It happened during the ongoing large-scale naval drill, ‘Veleyat-97.’ The war games are taking place in the area from the Persian Gulf and the Strait of Hormuz to the Sea of Oman and the northern parts of the Indian Ocean. The navy fired numerous cruise missiles from ships and coastal ground-based systems during the exercise. Tehran used the drill to showcase its newest frigate, ‘Sahand,’ and its Fateh-class submarines that military officials say can also carry cruise missiles. The massive naval maneuvers are being staged amid heightened tensions between Iran and the US. In December, the Pentagon deployed its nuclear-powered aircraft carrier USS ‘John C. Stennis’ to the Persian Gulf. It became the first American warship of its type to cross the Strait of Hormuz since US President Donald Trump unilaterally pulled the nation out of the Joint Comprehensive Plan of Action (JCPOA) on the Iranian nuclear program last year. As we said on Saturday, expect tensions between the two countries to continue to escalate as the US nears a decision on whether to extend, or end, the waivers on Iranian crude sanctions.